(Editor’s note: At the time this article was written, Lovepad Limited UK was in no way affiliated to a company of the same name Lovepad Pty Ltd in Australia. In October 2017 Lovepad Pty Ltd Australia purchased the name and copyrights of Lovepad Limited UK). 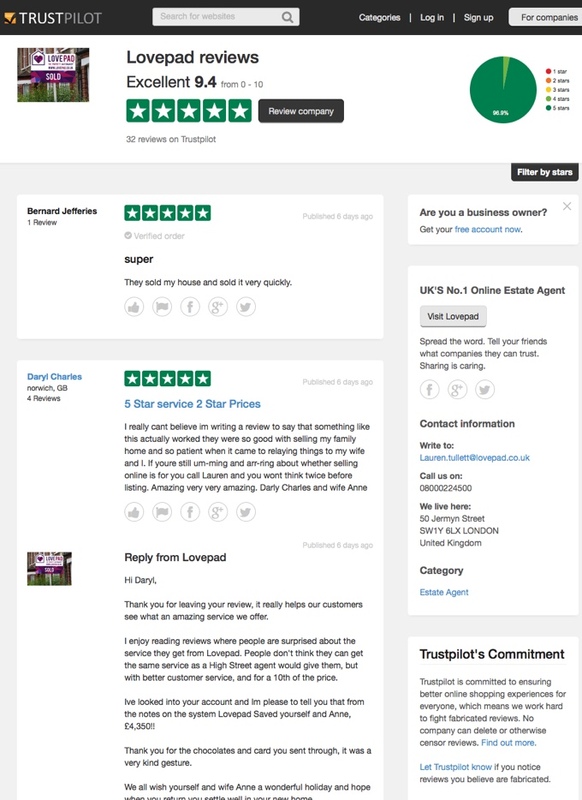 Trustpilot reviews of Lovepad site were taken down yesterday. A Trustpilot spokesperson said: “Trustpilot is aware of concerns raised about the reviews of Lovepad.co.uk and our compliance team has been investigating the matter. “All but one of the reviews in question have been removed from our site and we will be following up with Lovepad to investigate further. “We take issues around the authenticity of reviews very seriously and have zero tolerance for fraud – all reports of misuse are investigated. The spokesperson later clarified that it was not Trustpilot which removed the reviews. The Lovepad site is here and includes a slick video. 98% of homeowners get full asking price – yet our professional photographer couldn’t find a picture of one of our sold boards, so we photoshopped a haart one! Multi award winning estate agent? What awards? Can you imagine if us reputable estate agents showed a total disregard for the law like this bunch of Cowboys? It is to the industry bodies and Trading Standards eternal shame that the policing and protection of the public is now left to individual agents and trade journalists such as PIE. And what’s the point of ‘algorithms’ and ‘compliance teams’ if they can miss what appears to be a huge breach of CPR guidelines? Very few of these online agents allow their reviews to go through our triple-lock checks at raterAgent. Perhaps it’s because we’re still only a year old, or perhaps it’s something else. Disreputable agents have long given the whole industry an unfairly poor image. Weak checks similarly give the whole review industry a bad name and only help those disreputable agents. It’s got to be taken seriously and Trading Standards have got to act to stamp it out. How many other ‘reviews’ have just been waved through, unspotted by Eye? We get it you own a rating site, well done! As i have previously stated your site is vulnerable to fake reviews just like others. Nobody needs rating sites they are all a waste of money. Agents are better of showing testimonials locally on google plus, their own websites, in press. Much more targeted, more relevant and cheaper. You can go on any review site and instantly look who is “Bending the rules” in each town, it is glaringly obvious. The majority of the public know they are a joke and do not trust them, checkatrade = made up reviews from the owners of businesses, Trip adviser is owners and employees big up their own establishment run down others, Allagents, Rateragent, trustpiolet for property strange how one or two in a town have dozens of reviews and all the others have zero. Review sites are a leech on the property industry. Have you ever paid attention to a review of any product or service, smile please? A growing majority of people DO use review sites – and that’s in spite of your criticisms of alleged ‘glaringly obvious’ problems. They find them helpful, interesting and enable them to understand products and services before they buy. The Government believes this too, as their updated guidance link above states. Consumers increasingly love them. Government wants them around but to be fair and accurate. Same here. Just like you’re providing a service to consumers, so are we. We work hard to make sure that agents are fairly represented and their reviews accurate. If we make any mistakes we will fix them. You can talk to us. Imagine there was a site where 99% of the reviews were genuine and consumers could come and read about your great service. They’d know that you were better than your competitors, you would win more business and you could charge more in commission. That wouldn’t be a waste of time, would it? I can honestly say i do not look at review sites, the closest i come to a review is comparing two products myself on their merits. be it service, cost or technical. I do not trust review sites, and i hate to break the news to you many feel the same. Is it not strange that a lot of review sites the industries well know worse lead rankings? – You also are probably aware, large companies employ individuals or companies to post on their behalf. They have no social housing so are pushing the burden onto the PRS and then making as much money as possible off the back of it with local liscensing, stamp duty increases. The government have no idea about the property market and at least for the time being they are trying to keep a distance and not interfer with regulation. Also where does it stop? – Lets say agents see a benefit of a review site on mass and we all sign up (which i do not think will happen). What then? – you or whatever review site is market leading can then increase our fees, look to make us pay more for add ons, You are a commercial business so will look to squeeze us for more and more money and use our product! At least agents are upfront, we are in business to make money, we do this by offering a top class service and make sellers money. What do you do? you pop a review we have earnt on a website and charge us for the pleasure! Yes, review sites have historically had a bad reputation – you only have to look at the story this thread is under to have that confirmed. We are genuinely here to change that. We work hard to make sure that your competitors aren’t 5* reviewing themselves or 1* ‘bombing’ you. Our team reads every single review, checks them against Electoral Roll, Companies House, LinkedIn – even Facebook. We then enable those that pass our checks (we reject 1 in 6 as a fake) to be seen far and wide via starred-Google listings – and to appear on your own site, where they have far more power in the consumers’ eyes because they’re not just typed in by you. That’s a service for both consumers and for reputable agents, it costs money to do and it helps great agents to win new business at stronger fee rates. But you don’t even have to pay for this – it’s only the optional enhanced marketing elements that cost. I know that it’s easier to assume that everyone’s out to get you – and it can generate punchier comments in a thread. But it’s not the case here. raterAgent matches great agents with sellers and landlords looking for genuine, proven quality – and we’re working already. But is it not true rateragent has had complaints upheld against them from the ASA? To be honest Mal, you guys are all the same. Looking to profit from our hard work and making false claims. – And i thought estate agents in general had a bad name! Yes, 2 months after launch we were stopped from using the word ‘most’ – in ‘most trustworthy’ – because (the ASA were really explicit), our competitors wouldn’t reveal their review checking processes. Therefore the ASA couldn’t confirm that we were more trustworthy than them. Well watered down – maybe like a review some would say. But lets put it in context for others to make their mind up. You were advertising yourselves as the UK’s most trustworthy review site – A pretty big claim for anybody entering a crowded market place in just 2 months. Hang on – a lively debate on the thorny subject of rating sites and I’m not involved…? Sorry – but I feel like I need to come out of redundancy. You’re well aware that I’m far from a ‘believer’ in what you do. But you are always willing to stick your head above the parapet for the likes of smile please and me to take pot-shots at – and I give you due credit for that at least. Whether or not you will ever win me over is to be seen – but as far as I’m concerned today, until there is a Legal requirement to carry reviews, then I’m out. But let’s allow you to pitch some more. Please advise – what happens in respect of those that fail your checks? You have previously stated that persistent offenders would be banned from your site. How many, to date, have you actually taken the plunge and banned for such behaviour? How many are currently on ‘2 strikes’? And how many have, as far as your checks can make out, sinned just the once so far? It seems to me to be perfect sense that in order to reinforce your claims you should be shouting this information from the parapet you currently occupy. Please feel free to tell me I’m wrong – and why, of course! PeeBee i totally agree, everytime there is an article related to review sites there is Mal bleeting on about his competitors and how no one does it right apart from his site bla bla bla. At the end of the day personally I feel none of the reveiw sites do anything different apart from SAY they do. I would never leave my home in the hands of an agent I had not reviewed but everyone has their own personal opinion. It is up to individuals to “trust” reviews and I think common sence plays a big part. As for algorythms , secret formula’s all this carry on, I do not believe a word. How can you determine a fake review by its words and does Rateragent not copy google reviews which are completely not moderated? Does this not TOTALLY contradict what you are trying to do? It is part of modern society and any business opening today would be embracing reviews I feel. It is life, we need to accept it but also need to accept CHOICE is an important part of business and it is becoming a bit repetitive all the same old lines over and over again. BORED BORED BORED ! PeeBee; Really interesting question. We spend a long time worrying about how to deal with cheats. ‘Banning’ branches from raterAgent is counter-productive, as we want every branch to be available for people to 1* review if they want to. If we removed any branch then that would skew the market; sellers would not be able to see the bad comments. So we warn individuals who fake reviews by emailing them that they may find their reviews published with ‘FAKE’ across them if they continue to do so. No one has tried this more than twice. It is true to say that the number of fakes on raterAgent has decreased since the turn of the year and we think that’s because we’re becoming renowned for our stringent checks. There is no legal requirement to carry reviews. It can win you business and strengthen your fee rates when sellers and landlords want to understand the difference between you and (say) an online-only agent. So I’d advise it. Particularly as the basic elements are free. And we give 10p to a homelessness charity for every review that you get. We’re doing this differently, because we think consumers should know what’s different about your service. And the basic elements will always be free. It angers me that Most of us are so honest yet companies like this come along and show so much disregard for CPR & ASA guidelines and nothing is done about it! So many have already used them, yet no evidence of any being sold or advertised for that matter. Average saving of £5000, based on what? Should be investigated and brought in to line. Continue to let them get away with misleading the public and they will continue to do it. Agree 100% – Make an example of a few and we will not have to worry about others. Well i agree 100% more than online listers. Might have to get my PR team to knock up a press release. Speaking of press releases, Can we get a kiss and tell story from Mr Jury on the ins and outs or emove towers? Would be a fascinating piece. Suddenly PurpleBricks thousands of reviews on trust pilot make sense, its like a bright sunlight breaking through the gaps in the cloud – i see the light! … and here it is picked up from above. We are meticulously building evidence against repeat offenders and there will come a time, I’m sure, when we will have to ‘name and shame’ which agents are continually flouting our rules regarding fake reviews. I can assure you we do not take lightly to cheaters, this is the last resort but we do indeed name and shame those who try to game our system multiple times. …we warn individuals who fake reviews by emailing them that they may find their reviews published with ‘FAKE’ across them if they continue to do so. No one has tried this more than twice. * I ask this simply because your and Mr Mann’s statements are contradictory. HIS gave the clear impression that Agents have been ‘named and shamed’ whereas yours states the opposite.